One of the things I quickly learned after moving to the country was how to plan ahead for Jewish holidays, because way out here, there just aren't any kosher specialty stores. That's why I'm already thinking about Passover in January. The same is true for many other things people take for granted in the city. One of the reasons my wife and I are vegetarians (although by no means the only reason!) is because of the hassle and extra expense of trying to get kosher meat outside of the Metro area. I suppose I could have learned to slaughter my own chickens (one of the best-kept secrets of the kosher meat industry is that any Jew who knows how can slaughter for own his household, provided he doesn't sell the meat as kosher to others) but I'm just not cut out for that. My backyard chickens are friends, not food. And to be honest, we eat much better as vegetarians than we would be for the same amount of money as carnivores. There have also been years when I couldn't find fresh parsley for the Seder, either, because the local grocery didn't have it and there certainly wasn't any growing out there under the snow. In fact, this is why the traditional dipping vegetable at a Russian Jewish Seder isn’t parsley, because nobody in Russia had fresh greens when the ground was still frozen solid at Passover time. So they used a piece of boiled potato, which falls into the same pri ha-adamah ("fruit of the earth") blessing category as parsley. Even today, if you go to a traditional Lubavitch Seder, they still use the potato, because that's what their Rebbes used in Russia. A piece of carrot would do, too. Yes, I could order these things from the Internet (and I do that with some things, such as vegetarian soup mixes), but that's not the point. Simplifying my lifestyle and getting in touch with nature is. Up until recently, nobody had the same fruits and vegetables all year round. Eggs weren't so easily available, either. When I made the decision not to eat factory farm eggs and only use those from my own chickens or free-run hens from places I trusted, our winter diet changed radically. Right now, in the dead of winter, I'm getting maybe 6 eggs a week from my little flock, if that. So I'm not having eggs for breakfast today. They will get saved for baking bread and other things for the Sabbath. My winter breakfasts consist more of hot cereals. Urban Jews will read this and probably wonder why I put myself through all this trouble. But I think I have a better understanding of Hasidic stories when I live closer to the way that early Hasidim lived. Foods were seasonal back then, and this was reflected in the way our feasts were celebrated. Lots of spiritual reasons are given for serving eggs at Passover time (or Easter for my Christian neighbors), but the most down-to-earth one is, that, in the natural order of things, the hens start laying again in spring. I think it's important not to lose sight of that. the music of the spheres." This old Protestant hymn, which I learned in Scout camp many years ago, expresses the same consciousness as an ancient Jewish text called Perek Shirah, "The Song of Creation" a mystical hymn that even today is found in many traditional Jewish prayer books. It portrays all living creatures singing their individual songs in praise of the Creator. The universe is filled with hymns as cows, camels, horses, mules, roosters, chickens, doves, eagles, cats, mice, locusts, spiders, flies, sea creatures, fish, frogs, and many more offer Biblical verses as songs of praise to God. ﻿﻿ A number of years ago, I had an amazing experience; I actually heard a small part of the mystical Song of Creation. It was on a warm summer day, and I was walking through a field of blooming alfalfa. The air around me was filled with hundreds of little orange and yellow butterflies, the ones known as "alfalfas" or "sulfurs," flitting from flower to flower. Suddenly I experienced an expansion of consciousness in which those butterflies were actually singing! Of course, it wasn’t a song in the way we usually think of a song, there weren’t any words per se. It was more like a joyous energy that I experienced as an inner sound, in which those butterflies were expressing a level of absolute joy. I had, for a moment, touched a higher level of awareness about how nishmat kol chai, "the soul of every living thing," is praising God. Perek Shirah doesn’t mention butterflies specifically (they are apparently lumped in with insects in general), but they are part of Creation’s song, too. And if I were to assign a biblical verse to the song of those butterflies, it would be ivdu et HaShem b’simchah, "serve the Creator with joy." (Psalm 100:2) Most butterflies only live for a week or so in the adult stage, but judging from what I heard that day, they make the most of every joyous moment while they are here. And this is why Rebbe Nachman of Breslov told his followers to spend an hour a day praying alone in woods and fields. He even said that the grasses and trees would join in the prayers. I take that quite literally. Every living thing has a consciousness, even the rocks and clouds are sustained by the "holy sparks" (netzotzot) and emanations of God's energy. Sometimes, if we are very quiet and patient, we can tune in to their mystical songs. When my wife Caryl (pronounced "Carol") and I moved to Sandstone, MN in 1988, we got a pet rooster. At the time, it was legal to have backyard chickens in town, but one of my neighbors didn’t like me very much, and kept calling the city administrator to complain about the rooster crowing. As any rural resident knows, if you sneeze on one side of town, somebody will say "Gesundheit" on the other end. The fact we were Jewish --the only Jews in town and, in many cases, the only Jews many people here had ever met -- made us doubly interesting subjects of local gossip. It seemed like everything we did was picked apart in detail, often very inaccurately, but that's a whole other blog... Anyway, I got known around town as that guy with the darned rooster. My wife and I, in turn, argued that we were within our rights. Which we were. Meanwhile, Internet access came to town. I began setting up my personal website. When the ISP rep asked what ID I wanted, I said "rooster" out of pure cussedness. 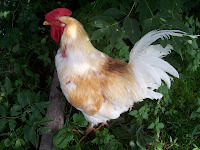 (So beware of angry roosters - -they use fowl language!) Thus was my nickname born. Even after we moved to our little hobby farm outside of town, (where chickens are no problem), I kept the Rooster ID because, by now, the website was linked all over the Internet. It also related nicely to the Hasidic parable by Rabbi Nachman of Breslov, about the mad prince who thought he was a rooster. (Read my re-telling of the story.) Or, some say, he was a turkey -- but I first heard it as a rooster... Besides, I'm not about to call myself a TURKEY! ﻿﻿ Then again folk tales do have a habit of mutating. Did you know that the "goose that laid the golden egg" was originally a chicken, too? So nu, what is this? A revisionist plot to deny chickens their rightful place in history? There's fowl play afoot, that's for sure... Not to egg you on about this, but if you really want to pursue this profound dilemma, then check out the history of the turkey and the origins of the domestic fowl (chicken). Nowadays, "613" has become a shorthand way that many Jews use on the Net to let each other know that they are Orthodox or Hasidic, similar to the way that Christians use WWJD (What Would Jesus Do?) to identify themselves to each other. There’s even a site called 613.org with an extensive audio-video library of talks by various rabbis. Now granted, the number 613 doesn’t have a meaning to everybody, but at least it has a back story that people might remember once they hear it. My guess is that you will remember it now and that’s a whole lot better than using my age or my Zip Code. However, we should note that not every "rooster613" ID online is really me. There is some woman using it on a dating site who definitely is NOT me! I emailed her once about changing it, but got no answer. It's not exactly identity theft, since she clearly is somebody else and not claiming to be me, so this was probably just a random coincidence. But it's a good idea to actually read the material in question and be sure you are actually talking to Rabbi Yonassan Gershom. Conversely, if you don't want to get a lot of rabbincal questions and/or hate mail about Israeli politics (and I'm a PACIFIST yet! Some people just target any Jew they find with their rants...) then it is a good idea not to call yourself "rooster613." When it gets this cold, the snow sort of crunches under your feet, and sometimes you hear a loud crack in the woods as a tree branch "explodes" from freezing. I also have to go to the chicken coop at sundown each evening and dump all the waterers or they freeze solid by morning. Chickens don't eat and drink at night anyway, but for the geese, who do, I fill their bucket with hot water at sundown, and that usually stays liquid until morning, at least, the geese manage to keep a small hole open to drink from. By morning there is a layer of ice lining the bucket. (I use a rubber horse-watering bucket so I can knock the ice out with a stick without breaking it. A plastic bucket would shatter in the cold.) In the morning I give everybody warm water and it stays liquid pretty much all day inside the coop, which has a passive solar design. Luckily the coldest days are also the sunniest, so it does warm up in there. We are even getting a few eggs. I noticed today that the rabbits completely stripped the bark from my new Honeycrisp apple tree I planted last year. Yes, I had put some chicken wire around it to protect it, but the snow got so deep, the bunnies could reach over it -- and they did. Completely girdled it. I'm going to see if I can take cuttings from the top and root them, or maybe graft them onto another apple tree in spring. Next time I suppose I should wrap the trunk with tree wrap or something. Gardening here is a constant challenge here. Last night (Saturday) I had to go out and shovel the huge pile of snow that the plow left at the end of the driveway. Normally I would not be doing snow removal in the freezing cold of night, but﻿ my stepson needed a ride to work, so I had to pick him up and get him there by 7am this morning. The snow came on the Sabbath (Friday sundown to after dark on Saturday) when I do not work, so I had no choice but to bundle up and go shovel last night. 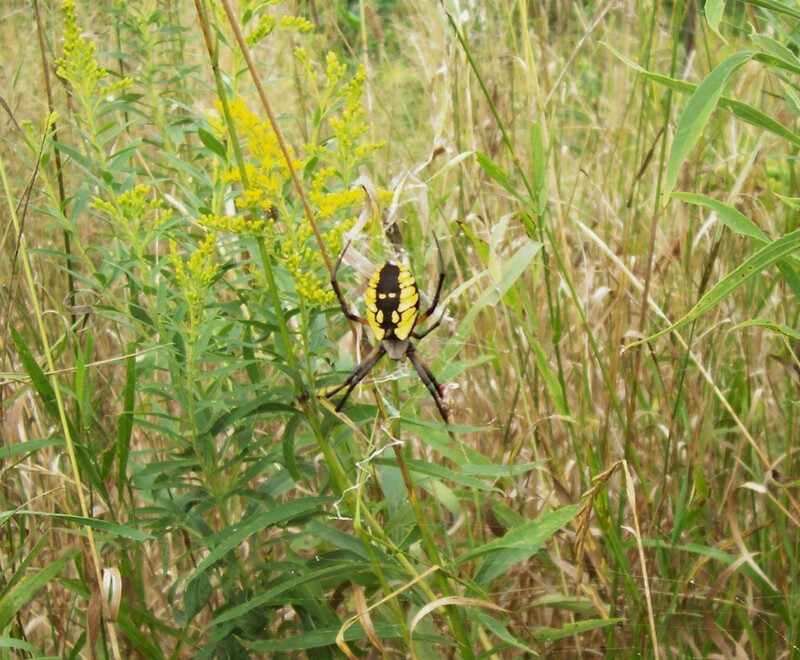 And this brought me into a very beautiful nature experience. The sky was clear, the moon and stars were out, the snow sparkled like diamonds, and the only sounds were an occasional car way off in the distance. Well worth braving the cold. I only wish the sky had been that clear when we had the totla lunar eclipse back in December. 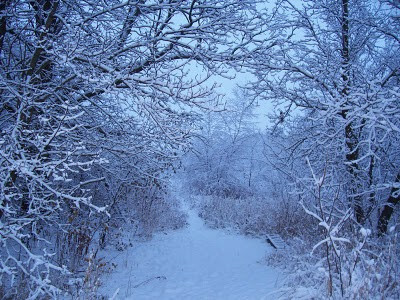 And this next pic is a view along the trail through our woods that I call "Dawn Wonderland." 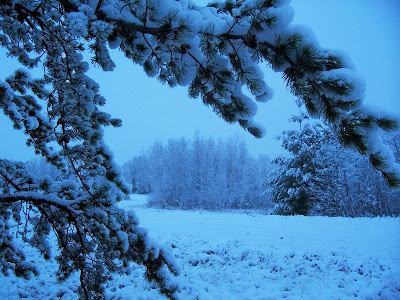 This was taken a few years ago after a spring snowstorm, and is one of my alltime favorites. You only get this "fairyland" effect when the snow is wet enough to stick to the trees -- and it only lasts until the sun gets high enough to hit the branches. So I have to get up and out there at pre-dawn when there is some light but the sun itself is not up yet. When I do manage that, I take all the pix I can before the show is over. I rather like the blue color, too. Once the sun is out, the snow becomes a glary white and loses this magical quality. The snow is coming down again -- the brunt of the storm is way south of us, but so far another inch or so has piled onto what we already have. 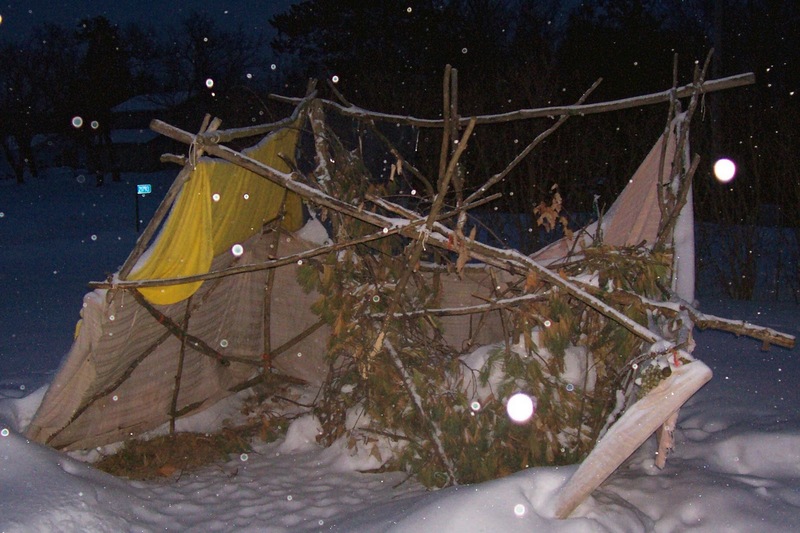 The frame of my sukkah (booth for the Festival of Sukkot) finally collapsed under the weight of the snow. Oh well, it's supposed to be a temporary shelter anyway, so I'll just have to build a new one next year. (Story continues below photo). For those of my readers who are not familiar with the Festival of Sukkot, you might know it as the "Feast of Tabernacles" ﻿ in the Bible, although the English word "tabernacle" calls to mind a fancy church building, whereas, a sukkah is a primitive booth that we Jews erect in the fall for a harvest festival. In fact, there are two completely different Hebrew words often translated "tabernacle": mishkan, which refers to the portable sanctuary that the Jews had while traveling with Moses in the wilderness, and sukkah, the harvest booth we are tallking about here. As you can see, a sukkah is a far cry from the Mormon Tabernacle! My urban Jewish brethren usually make their sukkahs out of plywood or other commercially-made materials. Many buy rather expensive prefab versions, then store them away in the garage after the holiday. I could never afford to do that. When I lived in the city, I used to make mine out of whatever materials I could scrounge, because it doesn't really matter what the sides are made of. One of my more memorable sukkahs was made of old refrigerator packing crates that I found behind the appliance store. Reduce, reuse, recycle! Nowadays, living here in the country, I prefer to use my campcraft skills and lash the framework together from saplings that I cut myself in the woods, then cover the sides with old sheets or blankets. I think this is much closer to what our ancestors probably used. And it's also a whole lot more economical. Lashing the framework makes it a somewhat permanent structure that I don't take down after the holiday. I used to remove the cloth sides and the pine branches on top, but then I noticed that my cats were sheltering in it while they waited to come in the house on windy winter days, the squirrels sometimes climbed on it, and birds were often hopping around on the top. I enjoyed watching this animal activity, so for the past few years I have left it up all winter, then removed the coverings in spring and made any necessary repairs to the framework. The Torah tells us that Jacob "journeyed to Sukkot and built himself a house, and for his livestock he made shelters; he therefore named the place Sukkot (Booths)." (Genesis 33:17). This is the first mention in the Bible of anybody making shelters for their animals (aside from Noah's Ark, of course!) -- and those shelters were probably something like my primitive sukkah. Which is why he named the place Sukkot. So I feel that by letting the animals use it after I'm done with it, I am much closer to how our ancestors lived. At any rate, come spring, I will have to completely re-do my sukkah frame, after using the old wood to boil down my annual batch of maple syrup. I need to remove some green ash saplings that are taking over the meadow area where the milkweed grows for the monarch butterflies, so this will be a good time to do it. I look forward to that, because it will mean some very pleasant days outdoors, cutting the poles and listening to the various sounds of the forest. There will be grouse drumming, pheasants and other birds calling, geese flying overhead, and woodpeckers chipping holes in the dead trees that I purposely leave up for them. 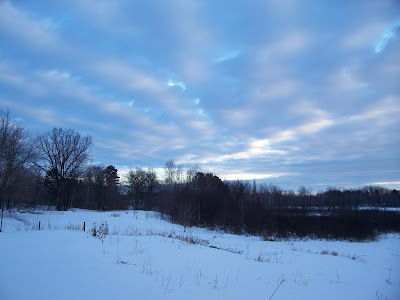 But right now, we have the silence of winter -- and that's beautiful, too. I just finished reading a book called Last Child in the Woods: Saving our Children from Nature Deficit Disorder by Richard Louv. “Nature deficit disorder” is not a medical diagnosis; it’s a term he made up to describe what he sees as a very serious deficit in childhood experience nowadays. The book examines some serious psychological research and concludes that direct exposure to nature is essential for healthy childhood development and for the physical and emotional health of children and adults. Louv makes the point that, as parents have become more and more worried about child abductions, accidents on playgrounds, lawsuits, etc., the lives of children have become overly controlled and, more and more, their playtime is all happening indoors. With many housing developments and condos having covenants forbidding tree houses, playhouses, even gardens in some areas, kids who do have a backyard have only dull, boring places to play. Everything is being so tightly organized by adults, there is little or no free time for children to develop their creativity. Add to this the fact that kids are spending hours and hours in front of TVs and computers, developing obesity problems and having heart attacks in high school (unheard of when I was growing up), and there is a serious problem affecting modern society. And we Jews are not immune. In fact, I think we have a worse case than the general population. I am often appalled at the lack of basic knowledge about nature in the Jewish community. In Chaim Potok's children's book, The Tree of Here , he describes a robin living in a hole on the tree -- but robins do not live in holes! Even Artscroll's beautiful coffeetable version of Perek Shirah: The Song of the Universe misidentifed a photo of a Grackle as a Starling, and one of the rooster pix is really a hen. Nor are these the only nature-oriented bloopers I've found in recent Jewish books. Although the Psalms and siddur (Jewish prayerbook) contain many verses about God's beautiful creation and how everything in nature is praising God, these have become mere words to be recited at breakneck speed with little thought as to their meaning in the real world. 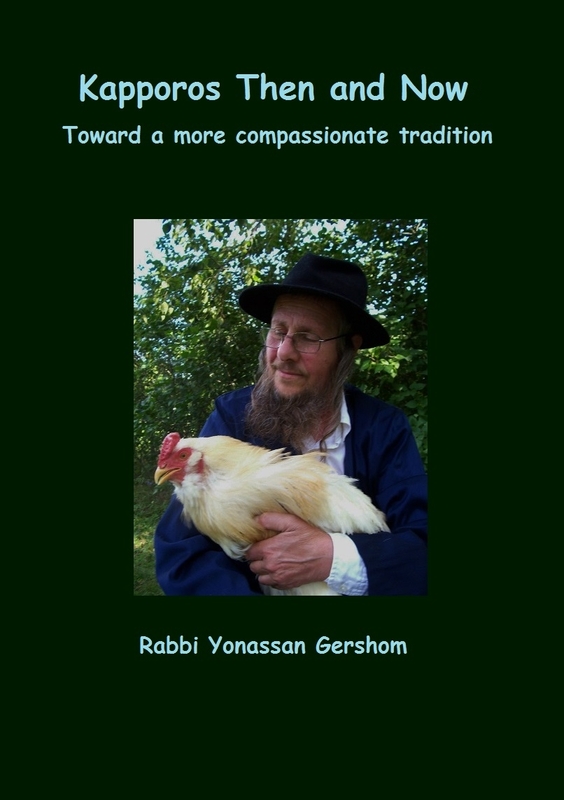 So, although many of our patriarchs and matriarchs were shepherds and farmers who spent a lot of time outdoors, and we have their beautiful references to nature in our classical texts, these teachings don’t stand out to most Jews nowadays. Why? Because there is no real contact with the outdoors to ground the texts in everyday life. For example, there is so much pollution in the atmosphere in urban areas that even if someone were to try to gauge the time for saying the evening Shema by seeking three stars, they would err -- if they could see any stars at all. So they rely on their wristwatches and astronomical calculations, which are not bad things in themselves, but if you have never looked up at a starry sky or listened to a chorus of birds singing at dawn, how can you make any real connection with the texts that describe such things? How can you picture God as a mother eagle sheltering Her nest if you’ve never seen a bird nesting, and know eggs only as something in Styrofoam boxes that you buy at the supermarket? 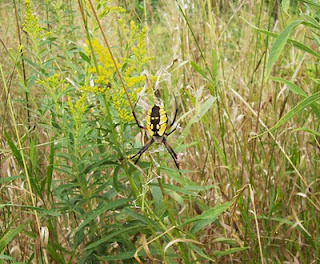 In many of our yeshivas, even the teachers often lack these firsthand experiences with nature. So they focus on stuff that is familiar to them, namely, the rules of kashrut and using animals as food. This, in turn, causes Jewish kids to see nature as something totally utilitarian. My good friend Richard Schwartz (author of Judaism and Vegetarianism ) tells how, when he was at an outdoor Sukkot gathering, the kids saw some ducks and said "Let's schecht (slaughter) them." This is a far cry from when I was a kid and we used to go feed the ducks in the park. When was the last time you and your kids did that? I was very lucky, in that I grew up in an area where I could go play in the woods --and my parents let me do it. This was not wasted time -- it was learning in a very different way. 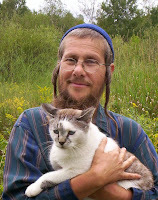 It enriched my understanding of Torah in ways that my nature-deprived urban brethren often cannot grasp. And it ultimately led to me becoming a Breslov Hasid, because of Rebbe Nachman's teaching about hisboddisus -- the practice of spending an hour alone with God each day. He recommended doing it in a forest or field because, he said, the plants and animals would join in our prayers. And he meant that literally. Breslovers still try to do that today, although in a city it is hard to find the solitude. But at least they have the teachings about spending time in nature, which many other groups do not. In fact, mainstream Jews have sometimes considered the Breslovers crazy to go wandering in the woods. Rabbi Odesser, (may he rest in peace), a Breslov teacher who died in 1994, once told how, when he started following that path in his youth, the local rabbi warned his parents that roaming in the woods could cause their son to literally lose his mind. Now, I don’t think being with nature makes you go insane. Quite the opposite is true: It restores your sanity and opens you up to connect with God in a very real and personal way. 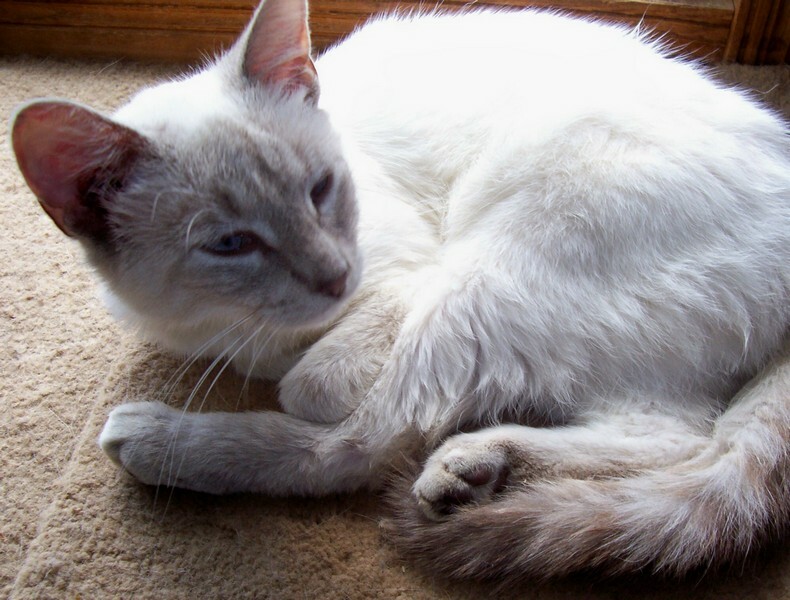 Our latest feline arrival is this pretty female Siamese/tabby who showed up after a heavy rainstorm this past summer (2010). She was way up in high a tree and crying pitifully. The white cat looked like a little spirit up in that dark spruce tree, so I immediately named her Angel. When I called to her she came right down into my arms, which told me she wasn't feral. But she was very thin and starving for both food and love. Nobody ever claimed her, so she lives here now, too. As soon as she was well enough, we got her spayed, thanks to the all the generous people who helped us out. She got so attached to me (sleeps on my bed now) that I did not want to traumatize her again by re-homing. She really is a very sweet kitty, I can't imagine why somebody would dump her. 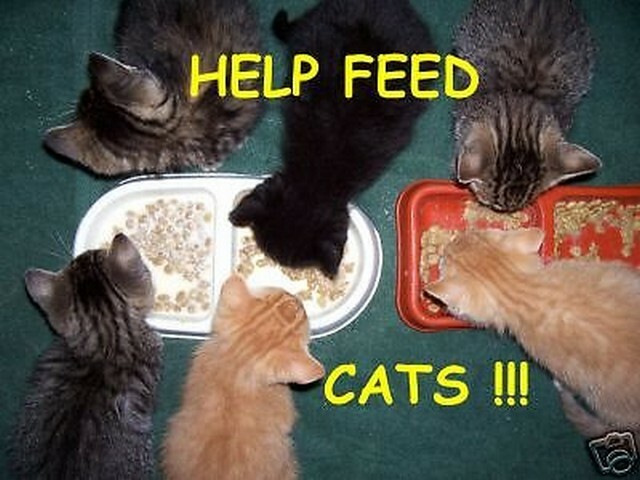 People have asked me why we have so many cats. No, I'm not hoarding them!!! Frankly, I'd rather have fewer cats -- as of this writing, the kitty count is at 13, which is a LOT of cats. The thing is, they keep showing up here on our farm, and I don't have the heart to send them to a shelter where they would probably be killed if not adopted. There have been a lot of foreclosures around here and I think many of these cats were left behind when their owners moved. People think (falsely) that cats are more attached to places than people -- not true, so never abandon your kitty!